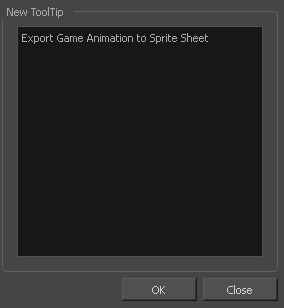 You can add buttons to the Scripting toolbar so you can access them easily. They will appear to the right of the default Scripting toolbar buttons. In the Functions list, select the function to add to the toolbar. Click the Right Arrow button to add the function to the In Toolbar list. To load a custom icon, click Customize Icon and browser for a *.png, *.jpg or *.xpm file. 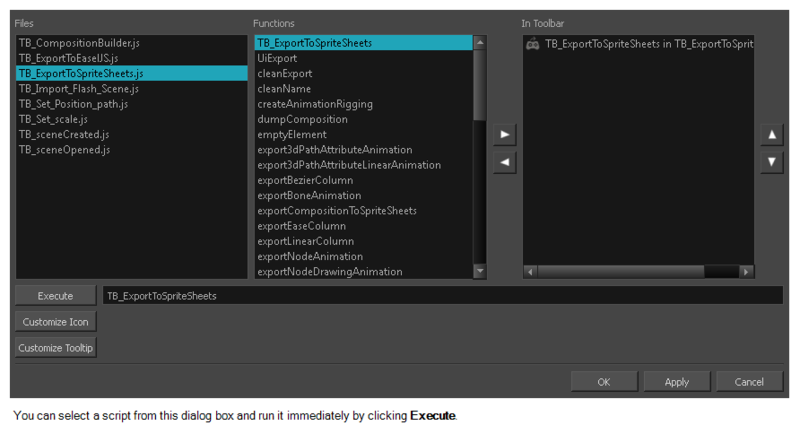 To customize the tooltip appearing in the Scripting toolbar, click Customize Tooltip and type in the new tooltip in the Function Tooltip window. Once the script is added to the Scripting toolbar, you can press on the corresponding script button to execute the action—see How to link a script to a toolbar button. You can press the Esc key to interrupt the execution of a script.